As we move through the remainder of 2015, I would like to tell you about the great strides we have made at Accelerize throughout this year as well as our vision for shaping our Company’s bright future as we head into 2016. First, and most importantly, I am pleased to say that we are on a pace to achieve another year of record revenue, trending to eclipse $21 million in 2015, a greater than 30% improvement over 2014. I believe the reason for achieving such tremendous growth is because we have remained focused on deploying technology solutions for the emerging marketing technology space. We have flourished by being uniquely positioned as the benefactor of companies across the globe flocking to spend their advertising dollars on digital media. In order to understand where we are going, I believe it is important to know how we got where we are today. For over half a decade we have focused on building a software platform to address the growing needs of digital marketers. As customer acquisition and lead generation began to migrate from traditional, to Internet search and into content to commerce, the way to effectively reach customers broadened from keyword searches to a wide array of digital touch points and mobile devices. This created a host of new advertising channels and digital media service providers. As digital migration continues to take shape, advertisers and agencies now have the ability to quantify in real-time the results of their efforts like never before, but they are faced with the challenge of choosing from a wide variety of digital methods to reach their target customers and difficulties in measuring performance across multiple channels including search, affiliate, social, mobile, video, and email to name a few. When we first developed CAKE, our Software as a Service (SaaS) platform, our vision was to seamlessly track the customer journey in real-time across the emerging digital marketing spectrum in order to maximize the effectiveness of an advertiser’s digital spending. Simply put, our software was designed to take the guesswork out of how companies can make the most out of their digital advertising dollars across the spectrum programmatically in real-time on the fly. This saves money and increases effectiveness which leads to more sales with less cost. I am pleased to say that as a result of our efforts, in a few short years, CAKE became the premier software platform in several important channels, helping us to achieve consistent revenue growth over the past several years. Because we are a SaaS platform this also means we have a solid and highly predictable recurring revenue base for the future due to our extremely high customer retention rates. As with any evolving market, the ability to understand changing dynamics is what sets apart product innovators from the rest of the pack and early in 2014 we identified a trend that we believed would open a vast market opportunity for our CAKE platform. We saw ad agencies and brand advertisers beginning the process of insourcing the management of their digital marketing deployment in areas where they previously relied on a network of service providers. To capitalize on this trend, we laid out a bold initiative to shape the future of our Company and how advertisers will manage their digital spending in the years to come. We focused significant financial and technological resources on evolving CAKE into a pioneering enterprise platform to help larger companies insource the management of their customer acquisition efforts by solving a critical issue: companies simply have too many marketing channels and platforms to monitor, making data evaluation of cross channel performance difficult, labor intensive, and time consuming. It boils down to this simple question: What good is having access to customer acquisition data if by the time you are able to analyze it is no longer relevant or doesn’t show the true customer journey? We launched our enterprise CAKE software tailored for direct advertisers late in 2014 to function as a quarterback, programmatically evaluating and managing spending through numerous channels and third party systems in real-time. This would enable brands to seamlessly work with advertisers, affiliate networks and performance-based marketers on a much higher level. It also expanded our enterprise software solution to a new and significantly larger market audience. Our initial roll out of this “Next Generation” of our CAKE software has been very well received and I believe we are only beginning to scratch the surface of this vast market opportunity. Already in 2015, we have achieved the first milestone in this market launch, with over 100 advertiser customers on the CAKE enterprise platform. I believe we are getting such a great response because our software essentially layers itself perfectly within a brand advertiser’s customer acquisition channel to maximize performance as the graphic below demonstrates. Our initial success has not been without its challenges. The main hurdle for us to overcome has been integrating a wide variety of software platforms and systems used by these companies to ensure the real-time efficiency of CAKE across the data spectrum. While platform integration initiatives temporarily slowed the usage ramp of these new larger customers moving onto the CAKE enterprise platform, we have worked diligently over the past two quarters to complete several large integration initiatives to resume our growth trajectory in this in-sourcing advertiser market. In fact, we recently completed a large integration with IBM resulting in CAKE being named as a paid advertising solutions partner for the new IBM Universal Behavior Exchange (UBX), a product designed to help marketers connect data across solutions and deliver personalized experiences based on customers’ behaviors and preferences. We expect the major integrations to be completed by year-end leading to a reacceleration of our sequential revenue growth in this channel beginning in the fourth quarter and into 2016. As we build this channel in the coming years we expect to see slightly longer sales cycles with new customer wins generating significantly higher rates of average revenue per customer. A second important initiative in 2015 has been our expansion into markets across the globe. After successfully launching a presence in Europe in 2014, we established additional customer acquisition offices in Australia and India in 2015. This resulted in revenue derived from outside the U.S. now accounting for 27% of our consolidated revenue recorded in the first six months of 2015, up from 21% in the same period one year ago. In dollar terms, revenues outside the U.S. in the first six months of 2015 were $2.8 million compared to only $1.5 million in the 2014 period. We see the developing markets overseas representing a strong area of future growth for CAKE as digital media continues to draw more advertising dollars in emerging markets. According to eMarketer, the digital advertising market is estimated to grow from $138 billion in 2014 to $204 billion by 2018 and a significant part of that growth will come from overseas markets, while total media spending will reach $656 billion. As our software now complements many of the most popular marketing cloud platforms currently on the market, including Salesforce, Marketo, IBM, and Oracle, we are confident that we can make significant inroads with international enterprise performance marketers that desire strong accountability and publishers offering a pay-for-performance pricing model. 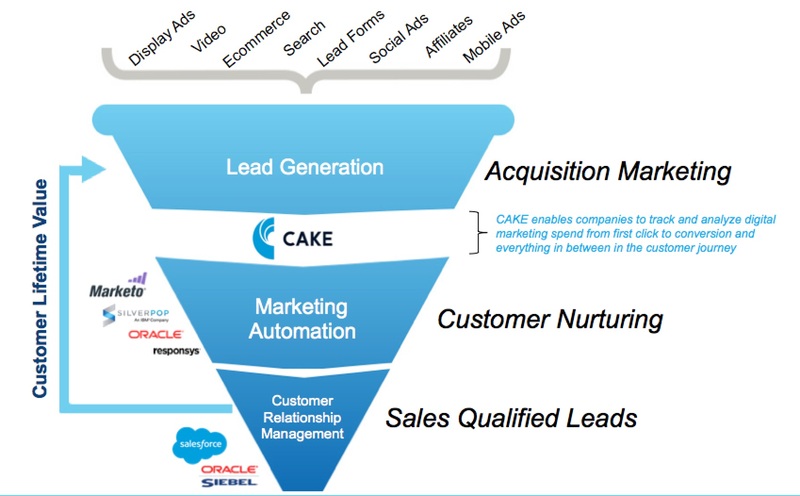 It all boils down to maximizing the effectiveness of customer acquisition/lead generation digital spending which is exactly what our CAKE software is all about. 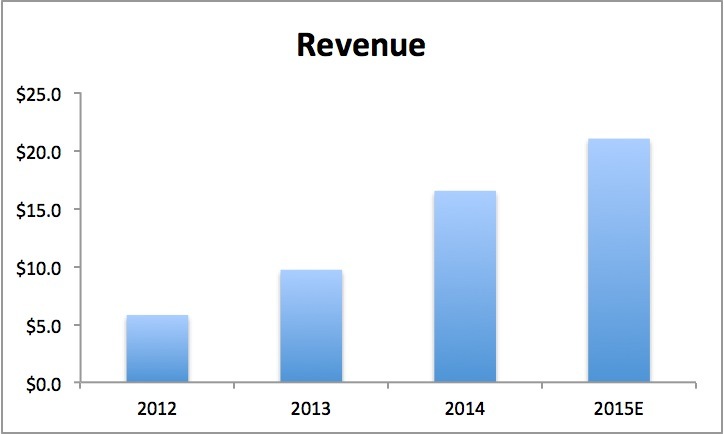 Throughout 2014 and through much of 2015 we have invested significant capital in software development and building our corporate infrastructure to handle future growth of our enterprise software. In August of 2015, during very challenging stock market conditions, we raised $2.1 million in equity capital at $1 per share to help us enter into what we see as the next phase of our corporate evolution, achieving sustainable positive cash flow growth. While we are disappointed with the market’s reaction subsequent to that event, beginning in the third quarter our management team has put that capital to work to implement several strategic initiatives to help us achieve that goal. First, we have begun the migration of our hosting operations from our current provider using dedicated hosting on a server-based system to cloud-based Amazon Web Service (AWS). We anticipate this migration to be completed in the first quarter of 2016 and estimate that CAKE on AWS will save the Company $1.3 million to $1.8 million in hosting costs in 2016. Second, we have reduced our overall employee head count by about 20% through operational streamlining and the automation of certain support services. And third, we have realigned certain marketing functions to our overseas offices where we are currently experiencing rapid revenue growth with overall employment costs that are substantially lower to help further increase operating efficiency. As Chairman and CEO of Accelerize Inc. I have never been more convinced that we are now perfectly positioned to be a major force in the fast growing marketing technology space. Our decision to build CAKE into an enterprise SaaS platform to meet the needs of advertisers, publishers and agencies across the digital marketing spectrum is building momentum and sets the stage for what we believe will be many years of growth for our Company and its stakeholders. Despite having experienced certain challenges that slowed our sequential sales growth in the second quarter that extended into the third quarter, we see that sequential growth resuming in the fourth quarter as we build momentum in 2016. More importantly, we believe our streamlining initiatives will enable Accelerize to significantly grow revenues and innovate further while significantly improving our bottom-line performance. As we push to build Accelerize into a world-class enterprise software company, we also have an eye toward strengthening our board of directors and corporate leadership team. I look forward to further updating our shareholders on our progress in this area. We intend to report our third quarter 2015 results on November 12, where we expect to report consolidated revenues totaling approximately $5.3 million, up 22% from consolidated revenues of $4.3 million recorded in the third quarter of 2014. We also expect to record a loss of $2.2 million in the third quarter as compared to a loss of $1.3 million year over year. That loss is inclusive of expenses related to the completion of our recent stock offering as well as our corporate streamlining initiatives. See below for more details about our Q3 financial performance. As I mentioned earlier, we see a resumption of growth in the fourth quarter leading to total revenues exceeding $21 million, which represents a record year and we expect more than a 30% increase compared to 2014 revenues of $16.5 million. As we resume our growth track heading into the new year, we are committed to achieve a minimum of 30% revenue growth in 2016 and we are working hard to exceed that goal. More importantly, the steps we have taken to improve operations are already becoming visible in our performance in the current quarter and we now see Accelerize achieving cash flow positive operations beginning in the first quarter of 2016. We are confident that this will provide us with the financial flexibility to fund the many sales expansion initiatives internally that will fuel our future growth. In closing, we have come a long way in a short time. I believe we are now poised and well positioned to achieve substantial growth in our top and bottom line financial performance for the foreseeable future. Our senior management team and entire organization is dedicated to achieving that goal in order to unlock the true value of what we have built at Accelerize for the benefit of our shareholders. I once again thank you for being a supporter of Accelerize and hope you find this update and transparency into our Company valuable. Revenues: Total revenues for Q3 2015 reached $5.3MM, a 22% increase from $4.3MM recorded in Q3 2014, and a 3% sequential decrease from Q2 2015. Operating Loss: Operating loss for Q3 2015 was $(2.1MM), compared to operating loss of ($1.3MM) recorded in Q3 2014. Adjusted EBITDA: Adjusted EBITDA for Q3 2015 was ($1.3MM). Adjusted EBITDA is a non-GAAP financial measure that excludes stock option and warrant expense and is defined below. Cash Flow: Net cash provided in Q3 2015 was $116K, compared to net cash used of ($32K) during Q3 2014. Operating Expenses: The Company’s total operating expenses in Q3 2015 increased 27% year-over-year to $5.6MM inclusive of $505K of stock option and warrant expense, and $275K of depreciation and amortization expense. Balance Sheet: Total cash as of September 30, 2015 was $520K compared to $404K on June 30, 2015. Total current assets as of September 30, 2015 increased to $3.3MM, an increase of 6% compared to $3.1MM on June 30, 2015. Total working capital decreased to $796K compared to $1.3MM on June 30, 2015. This press release may contain forward-looking statements from Accelerize Inc. within the meaning of the “safe harbor” provisions of the Private Securities Litigation Reform Act of 1995 and federal securities laws. For example, when Accelerize Inc. says that it intends to report third quarter financial results on November 12, 2015, when it describes its expected results for the third quarter of 2015, when it says that it is on pace to achieve another year of record revenue, trending to eclipse $21 million in 2015, a greater than 30% improvement over 2014, when it says that it has a solid and highly predictable recurring revenue base for the future, when it says that it expects major integrations to be completed by year-end leading to a reacceleration of its sequential revenue growth, when it says that it expects to see slightly longer sales cycles with new customer wins generating significantly higher rates of average revenue per customer, when it describes the expected growth in the digital advertising market, when it says that CAKE on AWS will save it $1.3 million to $1.8 million in hosting costs in 2016, when it describes its potential for growth, when it says that it is committed to achieve a minimum of 30% revenue growth in 2016, when it says that it expects cash flow positive operations beginning in 2016, and other statements containing the words “believes,” “anticipates,” “plans,” “expects,” “will” and similar expressions, Accelerize Inc. is using forward-looking statements. These forward-looking statements are based on the current expectations of the management of Accelerize Inc. only, and are subject to a number of factors and uncertainties that could cause actual results to differ materially from those described in the forward-looking statements. The following factors, among others, could cause actual results to differ materially from those described in the forward-looking statements: changes in technology and market requirements; our technology may not be validated as we progress further; we may be unable to retain or attract key employees whose knowledge is essential to the development of our products and services; unforeseen market and technological difficulties may develop with our products and services; inability to timely develop and introduce new technologies, products and applications; loss of market share and pressure on pricing resulting from competition, which could cause the actual results or performance of Accelerize Inc. to differ materially from those contemplated in such forward-looking statements. Except as otherwise required by law, Accelerize Inc. undertakes no obligation to publicly release any revisions to these forward-looking statements to reflect events or circumstances after the date hereof or to reflect the occurrence of unanticipated events. For a more detailed description of the risk and uncertainties affecting Accelerize Inc., reference is made to Accelerize Inc.’s reports filed from time to time with the Securities and Exchange Commission.